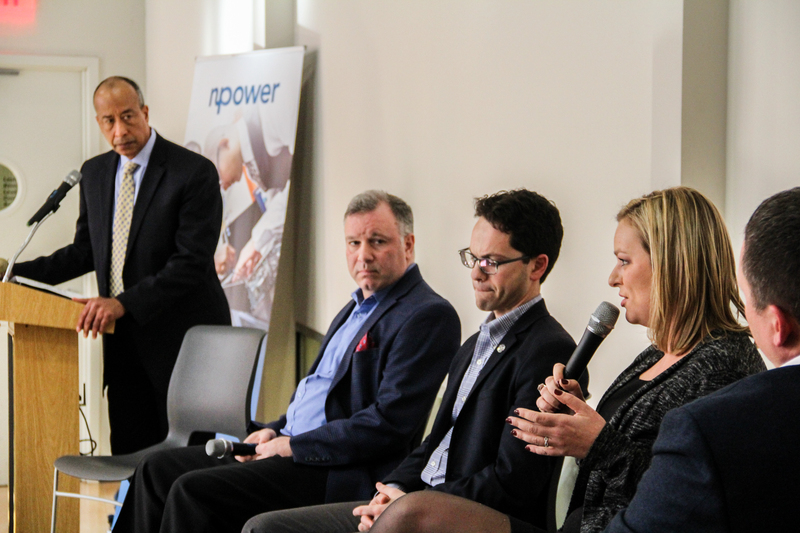 NPower, a national nonprofit that offers free technology skills training and job placement assistance to military veterans and young adults, recently convened a Leaders in Technology panel featuring executives who shared their career paths and advice for NPower students and alumni—many of whom are just starting their own careers. The panel was moderated by Mike Mason, SVP-CSO at Verizon Communications and panelists included Seth Wainer, CIO at City of Newark, Vincent Amatulli, CTO at Broadridge, Jeremy Sonnenburg, Head of Global Technology at RBC Capital Markets, and Rita Gurevich, President and Founder of SPHERE Technology Solutions. The panelists advised the group on characteristics vital to career success including commitment, sacrifice, focus, and perseverance. The presentation was followed by a Q&A session and the opportunity for students to network. The event was inspiring for both students and panelists, painting a bright picture for the future of tech in New Jersey.